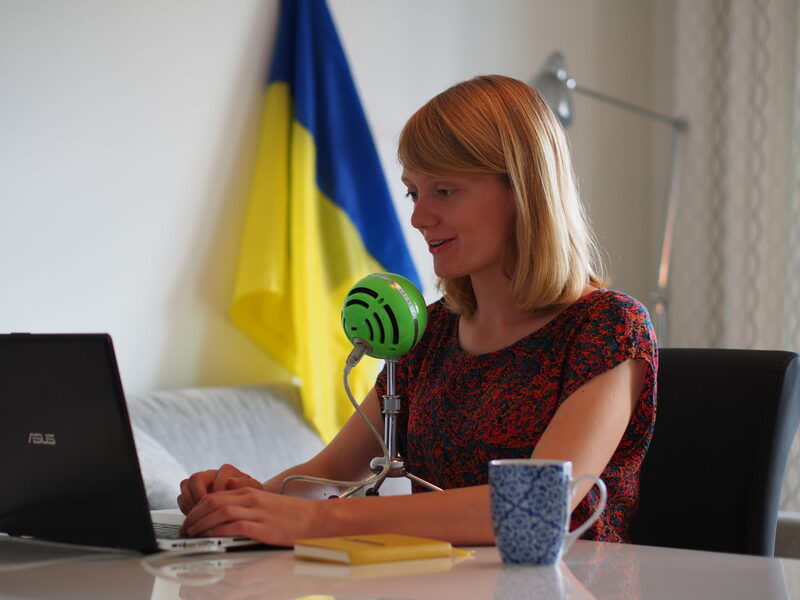 Start learning Ukrainian, improve your language skills and discover Ukrainian culture with Anna Ohoiko and the weekly Ukrainian Lessons Podcast episodes. 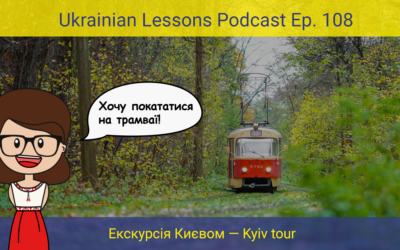 I have created the Ukrainian Lessons Podcast to give people all around the world access to learning my language wherever they are – on the way to work, in the car, or on the plane to Ukraine! I speak five foreign languages and I travel a lot. So, I feel like my strength and mission are to share the Ukrainian language and culture with the world by means of the digital technology. Join me and my students in this adventure! Вам подобаються писанки? Do you like Ukrainian Easter eggs – “pysanky”? 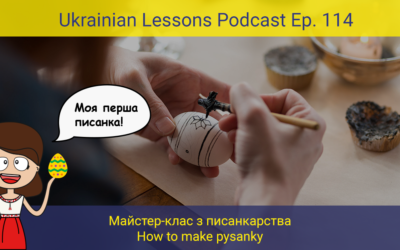 Learn how to paint them right before the Easter time in this advanced Ukrainian lesson! Умієте вишивати? Can you embroider? 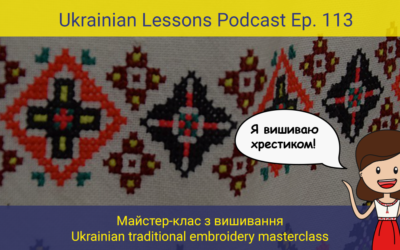 Listen to another master class in advanced Ukrainian to find out how to do it. Master the imperative mood and expand your vocabulary at the same time. Enjoy! Любите вареники? 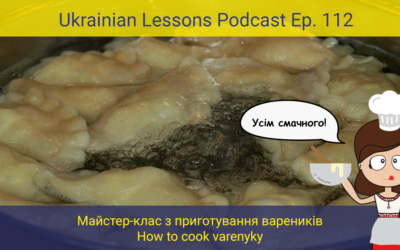 Learn how to cook varenyky together with Khrystyna in a workshop from Olena Bilous. And if you try cooking Ukrainian dishes at home, send us pictures in the comments below! It’s Khrystyna’s birthday! Listen to her roommate greeting her and find our what presents she gets. Then, start studying the imperative mood in Ukrainian at the grammar section. З Днем народження, Христино! 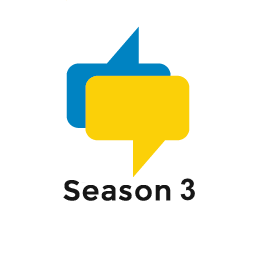 In this episode, review the material of the previous 4 episodes by listening to the Khrystyna’s voice message in which she tells her mom about her Ukrainian boyfriend. Enjoy! 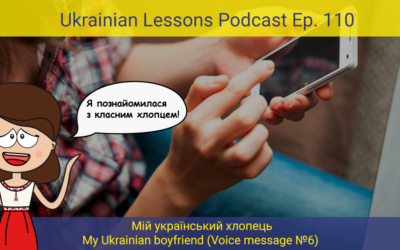 This is романтичний (romantic) Ukrainian Lessons Podcast episode! 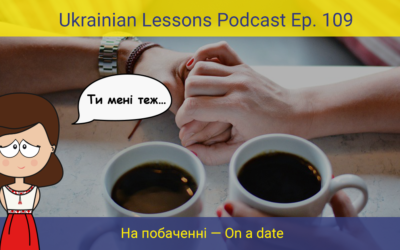 Listen to the conversation on a date in Ukrainian, learn new words and improve your knowledge of Ukrainian verbs finishing with -сь / -ся. Насолоджуйтесь! – Enjoy! Take a tour (екскурсія) in Kyiv with Khrystyna and learn more about Podil and other neighborhoods in the capital of Ukraine. Then, discover дієприкметник – adjectival participle in Ukrainian and learn more fun things with your Ukrainian teacher! 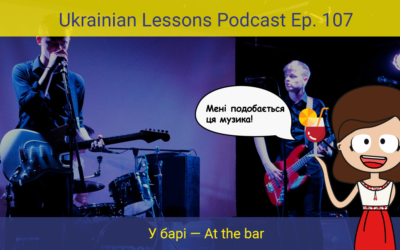 In this Ukrainian Lessons Podcast episode, you will hear a situation at the concert, at the bar in Ukraine (plus, some Ukrainian music!) 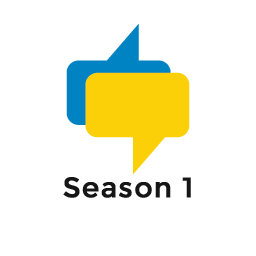 Learn also a Ukrainian part of speech called дієприслівник, and discover the verb and idiom of the day! 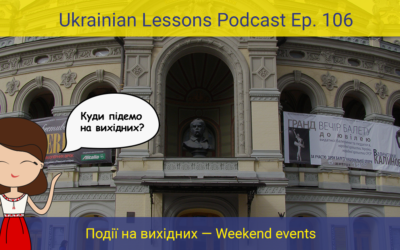 Listen to the conversation between two roommates discussing their plans and weekend events in Ukrainian. Then, learn more about the double negation and «negative» words (ніколи, ніщо, ніяк, etc.) Enjoy your ULP episode! 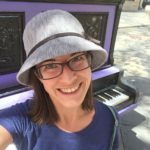 PDF lessons notes, word lists, flashcards, and private community! 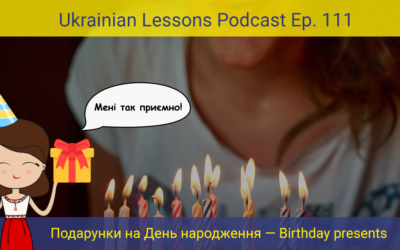 Make a step forward in learning Ukrainian becoming Ukrainian Lessons Podcast Premium Member.